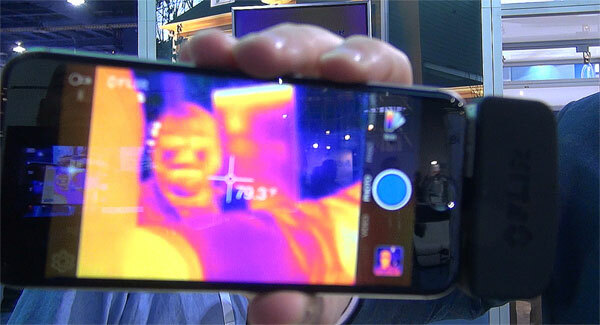 Stopping at the Flir booth at CES, I learned about how Flir has improved on their new FlirOne thermal imaging system for iPhone. They retooled the device and made it an attachment working for all iOS devices. Further, they added an Android version. I talked with Travis Merrill from Flir. Now there is a new iOS platform, they decided to go with a more portable connector – for iOS anything with a Lightning connector, and Android with micro-USB connector. Flir made some enhancements to the first generation FlirOne. The major enhancement is this device is four times the resolution. The camera has two optics – one with thermal imaging and a regular camera so you can overlay the two. Auto shutter gives you a constant temperature and no manual calibration. Finally, the FlirOne has a 1,400 mAh battery, giving it a good couple hours of use.